This week, we launched a tool on Kapwing to help users filter videos and adjust color online. 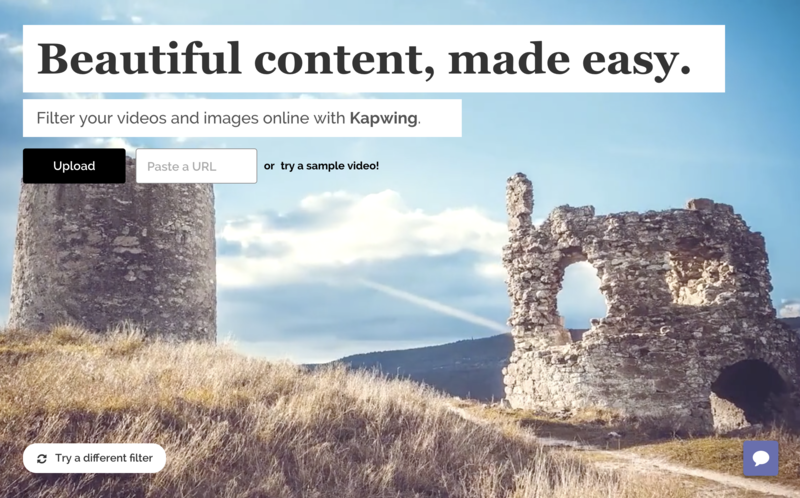 Kapwing is the first website that allows you to create a filtered video to publish across platforms. In this post, I’ll show how to use the filters tool and describe some of the use cases. Post-processing can’t make up for amazing lighting and color in the original footage, but adjusting and filtering can add an artistic edge to photos and video. Saturate landscapes: Natural lighting is hard to capture, so strengthening the color saturation can help compensate and make a landscape video more compelling. Increasing saturation can especially spice up a hyperlapse or cinemagraph. Make a mundane clip more interesting: If you’ve filmed an every-day moment, make it more special, cinematic, and sharable by applying an interesting filter. Add vignette: Bring an interview subject into focus by adding vignette (a black blur) to the borders of the image or video frame. Brighten a dark video: Have video footage from a bar or nighttime adventure? You can use Kapwing to increase brightness in a dark video. Just go to the adjust tab and use the sliders to get your video to an idea brightness. Make something look vintage: Try out a Sepia filter or increase the fade to make video feel more aged. You can emphasize the passage of time by shifting between a filtered and unfiltered clip in a longer movie. Go grayscale: Removing color can add drama to a scene since it emphasizes the silhouettes. You can preview the Kapwing filter library on our homepage. Make sure to try out Japchae and Hockaday, our most popular filters. Kapwing’s tools are designed for people with no formal video editing experience, so you should be able to jump right in. Step 1 - UPLOAD: Go to Kapwing filters tool and upload a video, GIF, or photo. You can either upload a video from your computer or you can paste a link to a video from Youtube or somewhere else on the web. Step 2 - FILTER: You can preview the Kapwing filters on your video by clicking through the filter tiles on the left. Step 3 - ADJUST: Change the brightness, contrast, and saturation or add fade and vignette in the “Adjust” tab. Step 4 - DOWNLOAD: Once you’re happy with your video, click Create. Once your processed video is ready, you can download it and publish it across platforms. 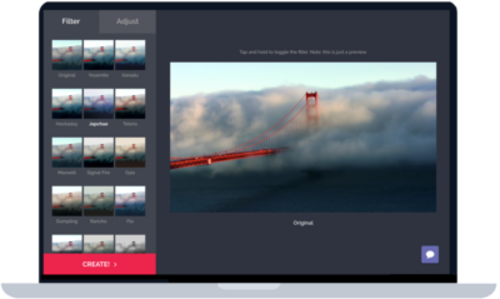 You can also use Kapwing’s resize, trim, and loop tools to optimize your video for sharing. All Kapwing tools are free to use, but you need to pay a fee to remove a small watermark from the output videos. It costs $3/video or $10/month for unlimited no-watermark videos. Building the filtering product was harder than we expected it to be; color is complicated, and color transformation matrices were a throwback to our linear algebra classes from college. But we’re excited to bring video filtering support to the web! Please try it out and let us know what you think. Fun fact: Eric and I named the Kapwing filters after important places, people, and things in our lives. Thanks for reading and keep following along as Eric and I climb towards ramen profitability.